Last year I spent a majority of the Fall and Winter season hunting the oh so beloved Herringbone vest. The vest JCrew made us all salivate over and Pinterest smothered all over their fashion boards! I begged my husband for one for Christmas, but he never caught them when they restocked. So this year when I saw Shop Blue Avenue pop up on my Twitter feed saying they had 3 small vests left, I didn't hesitate. It's just such a great basic/statement piece that you can really pair with anything and I'm excited to play around with it. See my next wardrobe attempts with my vest below. 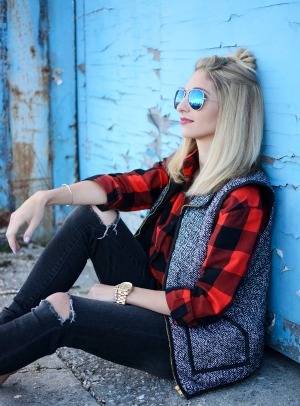 Do you own a Herringbone vest or something similar? What's your favorite outfit to put together with it? 16 comments on "Just a girl and her Herringbone"
I LOVE this outfit! You're so lucky that you got your hands on that vest. Fabulous outfit, lady! I love the white hat, perfect hat for the outfit. So adorable! I love that it still zips!! I ordered one that looks just like this from Groopdealz a month ago and now they are having problems with the vendor. Maybe one day I will finally get my vest, lol! This vest was a purchase I made earlier this fall and certainly have no regrets. I love how you styled it! You look oh-so-cozy with that hat and red Starbucks cup! Love this look, those boots are awesome! I finally was able to get a vest and I could not be more excited. I have basically worn it everyday. I'm in love with that vest! I really want it, but I cant find it anywhere in my size! I should of jumped on it sooner! Also, I have that exact hat from Target and have it in 3 different colors. I love beanies like that because they don't completely ruin your hair! Love the vest! I saw one very similar at Old Navy on Black Friday! Gorgeous as always!